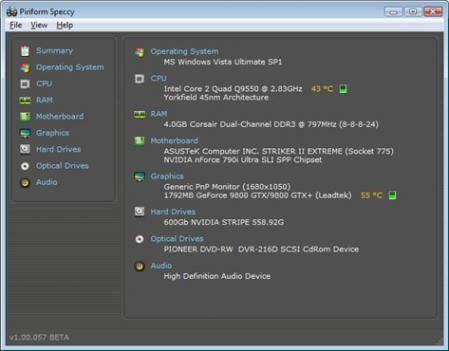 Speccy is a powerful System Information utility for PCs that provides comprehensive information and statistics about all computer hardware parts, including CPU, motherboard, RAM, graphics cards, hard disks, optical drives and audio support. The program will also display temperatures of various components, allowing you to easily discover related issues. Altough very suitable for system administrators and advanced users, Speccy is also a handy and easy to use tool for regular users. For example if you need to buy new hardware parts you can verify with Speccy exactly what you need to make sure they are compatible with your system.